February is hurtling along at a pace of knots, my days are fiercely full, and I am flying on a high. How is this remotely possible, you might ask, if you learn that we are coursing through what may go down in the statistics as one of the warmest, wettest winters in recorded memory, experiencing howling winds and pelting rain which should keep the sane indoors? Of course there is always someone worse off, our poor neighbours in England, for example. What doesn’t flood, submerge and tear through their homes and lives goes on to pummel us here in the Netherlands as we deal with their weather leftovers. Of course, it’s all the North Americans’ fault. If they weren’t hogging all the cold, we might have had a decently frozen winter after all. Not that I am complaining. On the contrary. Vicki and I are recently back from that saturated land (Glastonbury, Somerset) across the ditch (the English Channel), where we attended an Equine Touch practical course, before completing all requirements for Level 3. The course itself was one of the best we have attended. A largish group of predominantly women (I was the token male) with a wicked sense of humour ensured that it was as fun-filled as it was educational. To them I am grateful, as I am to our instructor, Lyn Palmer, and to the many horses with their issues who allowed us to help them, as we learned to improve our Equine Touch skills and did our practical assessment. Equine Touch class. The woman in the space suit is Vicki. Vicki and I have just been informed that we have successfully completed all requirements for Equine Touch Level 3, which includes theory, anatomy, physiology, case assessments featuring two Equine Touch sessions on 10 different horses in addition to our practical assessment. Apparently we have obtained ridiculously high marks and have secured unprecedented praise, which I personally cannot reconcile with my actual performance. Still, it is great to receive confirmation from those with greater expertise and more extensive experience, that we are definitely on the right track and are making good progress. It was also good to be back in Glastonbury. It is such a quaint, alternative place featuring shops with gloriously whacky names. Vicki and I find it difficult not to think of our time in Byron Shire, Australia, whenever we are in Glastonbury. Another oasis of sanity in a crazy world. 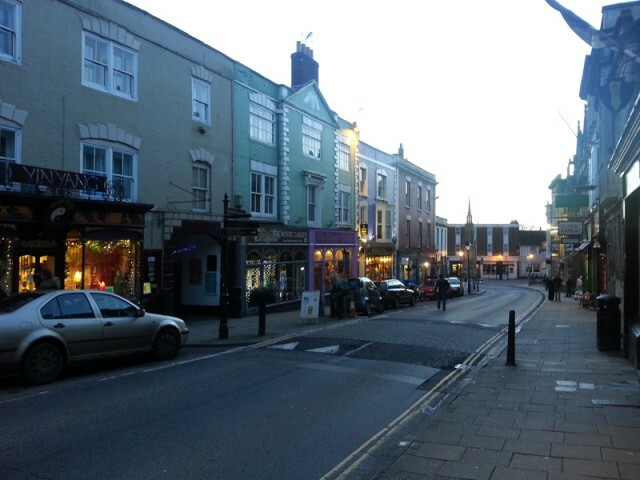 High Street, Glastonbury. Spot the whacky shop names. Lovely! Back home, Vicki and I are now heading down the final straight towards the status of Equine Touch practitioner. In between everyday work and our daily visits to our own horses we are fitting in Equine Touch sessions with other people’s equines. This time we need to prepare detailed case studies covering three sessions with 20 different horses. In addition, we need to complete three lots of written work: theory, anatomy and physiology, and an essay. Our target is June, when we hope to head over to England for a Level 4 course with Ivana Ruddock, one of the founders of the Equine Touch Foundation. All in all it is a highly educational if not sometimes an exceedingly frustrating experience. 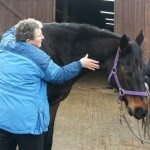 Shortly before we went to England for our Level 3 course and assessment, I accompanied Vicki to a stable around the corner from us, where she performed Equine Touch on a beautiful five-year-old mare. There various so-called sport horses are kept in stables 24 hours a day, their only outings being a daily ride in a manège and a session in a horse walker. The same saddle is used for all of the horses (I kid you not) and they are ridden in typical Dutch dressage fashion: pull the neck into a frame with the head behind the bit so that the crest rather than the poll is the highest point and then ride the animal into the bit, a bit like driving a car with the brakes on. For reasons beyond me, the owner could not understand why the mare was experiencing physical difficulties in its withers, shoulder and neck, as a result of which she was “playing up”, which could mean her premature death if it is not resolved (“unusable” sports horses are often euthanised, even if they are otherwise healthy and would be healthier if allowed to live as horses). Vicki with Wilson. Even gentle giants benefit from Equine Touch. Before leaving for England, Vicki had advised the owner to have the saddle checked and to seek the advice of a skilled, professional saddle fitter. Following our return all communications from her to the owner have met with a loud silence. Fortunately, for every sad story there are at least a few brighter ones. 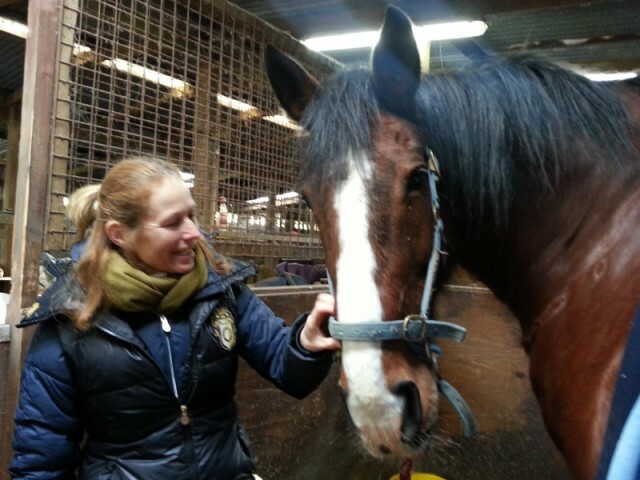 We are seeing progress in most, if not all, of the horses that we are privileged to help. Of course, Equine Touch on its own is not enough and neither is veterinary care. Perhaps the greatest need that we have, if we are to help horses, is not to put our hands on them but to educate their owners. 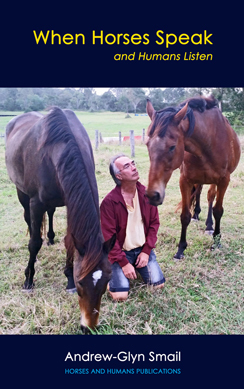 Jock Ruddock, the other founder of the Equine Touch Foundation had a vision which is reflected in the foundation’s mission statement: helping horses by educating humans. Amen! In my last post (Horses, Herd, Hooves, Horseshoes, Hempfling) I mentioned that a buckle had broken on one of Pip’s horse shoes (meaning shoes horses as opposed to metal studs on their hooves), that this meant that she was only wearing shoes every other day, and that this was probably meant to be. This is confirmed by Pip’s full recovery. I watch in awe as her right fore hoof is changing before my eyes. The sole is growing thicker and there is increased concavity. As a result Pip is standing and walking straighter and more upright, and she is alive and alert again. The difficult period that Pip has experienced in the past few months has also produced significant benefits. Both Vicki and I have noticed a major change in her. She has come to rest and has abandoned most of her anxiety. In my interaction with Pip I also notice that we now have a far closer bond, as though I have finally earned her trust, that she feels secure with me. This is reflected not only in our general interaction with each other but also in our training together. In this I am reminded of the two great mentors whom I frequently referred to in this blog. It is Klaus Ferdinand Hempfling who regularly points out that a horse will only give you its trust, if you can help it feel secure, although I don’t for a moment believe that it is a question of just a few moments during the initial encounter in the case of most horses, as he would have us believe. And it is Michael Bevilacqua who makes it very clear that “understanding and trust have nothing to do with training”. Once you have that understanding and trust, however, then the training can begin in earnest. One of Hempfling’s strengths is his insistence that riding is not the be and end all of the relationship between horse and human. Rather, it is the icing on the cake, the apex of a huge pyramid representing different types of interaction between the species. We may or may not get to it. Whether we do or not is nowhere nearly as important as the journey towards it. preparation together with the horse on the ground – as the Hempflings and Bevilacquas of the world have shown, this is the starting point for riding together with the preparation of the human. Without it, I would go so far as to say, expect to experience problems, major ones. Like any programme, of course, it is just a plan and, as such, it is open to change. Part of the inspiration: Hempfling riding one of his former student’s horses. In the period ahead I hope to share with you the types of activities that Pip and I will be involved in, the progress that we are making, the setbacks if there are any, and anything else which comes to mind. Some of you are further on this journey than I am. If you have any feedback, any ideas, tips, anything, I would really like to hear them. Never before in my life have I ever attempted to do something like this. It is a daunting prospect, a challenging one but I feel alive and, if Pip’s responses are anything to go by, so does she. Perhaps after all of this preparation I will never get to ride Pip but that is also fine. Today Vicki and I are celebrating our 18th wedding anniversary. 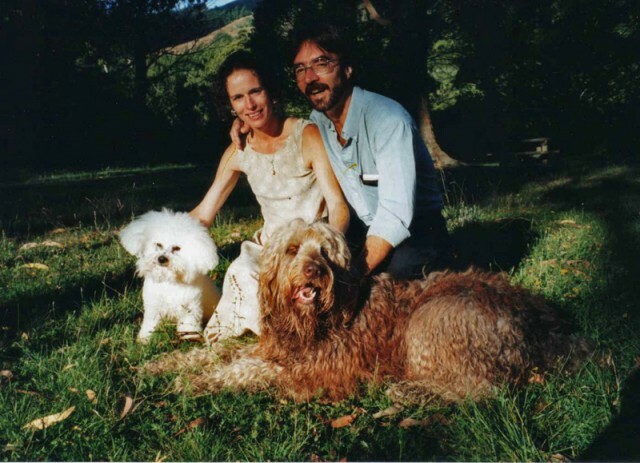 We got married in a beautiful forest in New Zealand surrounded by close friends, Vicki’s twin sister, Agathe, and our dogs Dubu and Smudge. Prior to that we had been living together for 13 years and a bit and had been opposed to marriage. Yet getting married gave us the opportunity to reconsider just what our commitment to each other entails. Sometimes you only discover your soul-mate as you grow together. 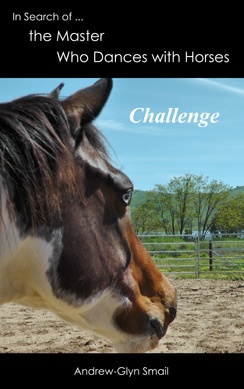 I continue to admire your preparedness to put yourself out there and share your journey into and with horses – warts and all – with many people around the world. I am inspired by some of it, don’t agree with some of it, am provoked or prodded into thinking more by some of it, but always enjoy reading all of it. Looking forward to further entries. And well done to you and Vicki on your excellent results in Equine Touch. I have no doubt both of you were most deserving of it. My heart breaks for the “sport horses” around the corner from you, but is glad for others you are helping and owners whose eyes you are opening. When I look at what I have been and am doing with horses, I often shake my head in disbelief and can just imagine that many people who read some of the posts on this blog do the same. And yet, if Pip is right, perhaps I am helping to make life a little easier for my horse and by doing so, a bit more meaningful to me. When I consider that I am just an ordinary person simply trying to do what so many of us want, I feel that perhaps I am not the only person who shakes their head in disbelief when they see how they spend time with a horse. Perhaps if I can make things a little easier for both the horse and the human while doing this, others as ordinary as me will see that they can do exactly the same. In this small way life could become just a little bit easier for a few more horses and a few more humans. And if it does, would that not make this blog even more worthwhile than it already is for me? Congratulations to you and Vicky…. !! re your wedding anniversary but also re Equine Touch so far…. Yes, I would dearly love to hear your views on how Pip and I proceed down the path we are moving. This is truly virgin territory to me and every helping hand is welcome, especially one that is guided by the experience and insight that you obviously have. And no, there is no need to be gentle. Dear Andrew..so yes I decided to take a first exploring look at your Pip-Recovered-video..